Marin's Luxury Gated Retirement Community: Smith Ranch Homes voted #1 Retirement Community in California by TopRetirements.com. This special unit commands a southern exposure with a serene outlook, overlooking a private park courtyard. Sited in the Building affording the greatest convenience to residents, it has access via underground passage to the garage and Clubhouse. Featuring: 1 bedroom, 1 bath, living room with 9’ ceilings, kitchen with a full complement of appliances and granite counters, marble countered bath & fireplace, walk-in Master closet, stacked washer/dryer and extra storage make this property a true value. The focal point of Smith Ranch Homes is the Clubhouse with its understated elegance. It is the social, recreational and service center of the community with gourmet dining in two fine restaurants. 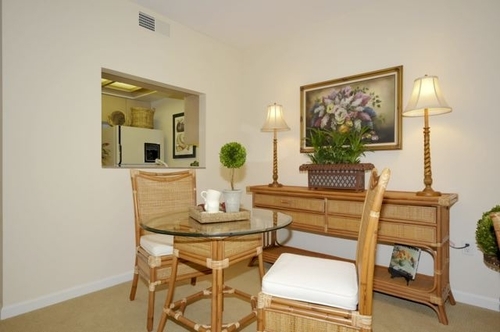 It is surrounded with beautifully landscaped gardens and walking paths. Distinctive quality, thoughtful attention to detail, and the abundance of services and amenities make Smith Ranch Homes a truly remarkable value. plus continental breakfast Mon.- Fri.
Smith Ranch is a gated community, it is necessary to schedule an appointment. Properties are shown weekdays and only by appointment.